When I saw these rattan tables on Craigslist a month ago, I knew they had to be mine. In fact, when I emailed the lady who listed them, I actually said "Your rattan tables must be mine!" I think she was amused. I got them both for 20 bones! I chose a spray paint color that has been mentioned as a favorite on several blogs that I read, Krylon Blue Ocean Breeze. But before the awesome color could go on, I had to do my due diligence and prime the tables with Cover Stain primer. And then I spent waaaay too long sanding down all the gross sandy texture the primer left behind. The middle part of the table was not fun to sand down. Hell to the no. When it was finally time to spray the fun stuff, I realized that I did not obey the cardinal rule of spray paint. The rule being, however many cans you think you need for the job, add two. I got this far and had to go buy two more cans with the tops still unpainted. 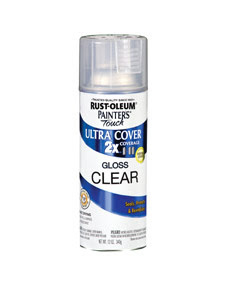 The final coat was a clear coat of gloss, the Rustoleum Ultra Cover 2X brand. This is some donkey stuff. I was spraying and spraying and it didn't look like anything was happening. It certainly wasn't gloss....it was more like wannabe satin. Either way, I blew through a can of this and said enough was enough. Once the glass was put on top (with clear rubber discs to avoid ruining my hard-earned paint finish) I was pretty pleased. Total cost was $30 with the spray paint - there was a sweet sale, so I lucked out and got all four cans of Blue Ocean Breeze for just under $10. Not bad! wow. 4 cans under $10 is a major find. this color blue looks perfect against the orange accent lamps and pillows. lovely. Seriously. The red and aqua is totally killing me. And I know that I wouldn't have bought those end tables, because I wouldn't have seen the potential. I need to open my eyes. I still love them with the red lamps. SO FUN. YES! I used gloss spray on my white table and chairs... Result: no gloss, just... something. I guess painting on poly is best for gloss? You should enter this to the latest challenge at thecsiproject.com! You're killing me with your vision! LOVE LOVE LOVE this color! oooooohhhhh weeeeeee!! It turned out beautifully, gorgeous color. I had a simillar experience with the gloss spray thing- so frustrating. They look so cute. Great color. They look awesome! I love the color choice too, very bold. It always feels good to make a cheap Craig's list purchase into something nice. Your sun room is looking really good! Enjoy it! Nice! I never find anything good on Craigslist. Boo! Where did you snag those pillows from? I love 'em! That is a great project! 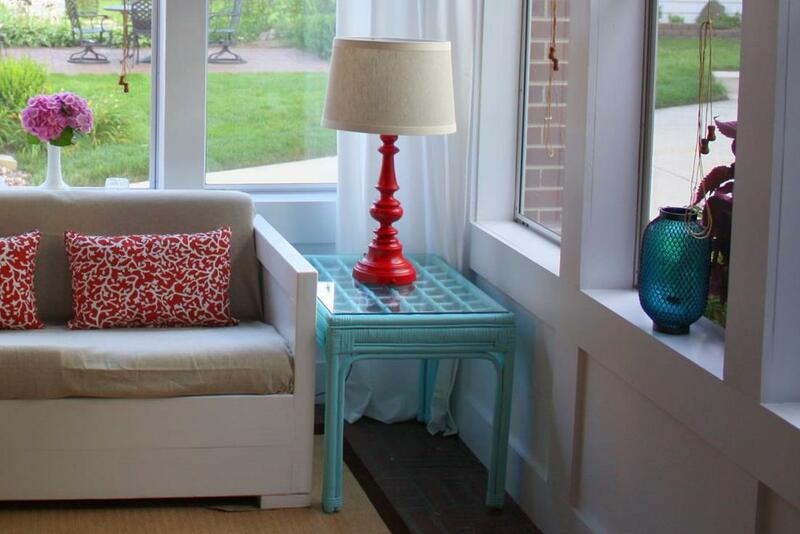 Adds great punch to the well pulled together porch - I'm jealous! I really wish someone would email me and say "Your must be mine!" I totally hear you on the amount of paint needed, too. I only used one can on my recent trash find, but I really need to go back and fill in some teensy missed spots. Apparently that's a lot of surface area to cover! These look frackin' awesome, and as I mentioned before, especially with the hott red lamps! You KNOW I'm loving the vibe of that room, and what a sweet score on the tables. Great colors. Seriously? Love. And I'm a firm believer in being a slight weirdo when emailing Cl'ers. Ya gotta stand out, ya know? I can't get over how much I love the red and blue together. Amazing. Well done - the red and aqua looks fantastic together. Lovely! Great find and great color choice! They make me smile! Okay - the tables by themselves are pretty great, but you know what's even better?! The way you put the whole look together! The red makes the scene just POP. I am also currently scouring cl for some bamboo furniture to paint; bright red in my case. I only recently discovered that I need to search under "rattan" for more results! I am in Milwaukee and fear that we may someday meet via a craigslist purchase showdown!!! lol! What a diamond in the rough! Great eye girl. I can't wait to read on to see the sun room reveal - I haven't been by in forever and I miss all of this. Your tables look amazing! Just stumbled upon your blog and wanted to let you know that I love DIY projects, and these tables are a great example of the benefit of DIY projects-you get the exactly what you imagine (sometimes, lol)Thanks for sharing these pics, very inspirational for other DIY'ers! love those!! the colour is awesome. I sprayed a bamboo tv console that my parents have had for 30 years glossy black and I love it!